Ntxw wrote: El Nino has just about arrived. A bit late but came no less. By all figures next update on Monday should be 0.5C or greater. The winds, SOI all paint the picture. Given the seasonal tendencies and shifting climo it will be a steady climb until winter. Indeed, it is. 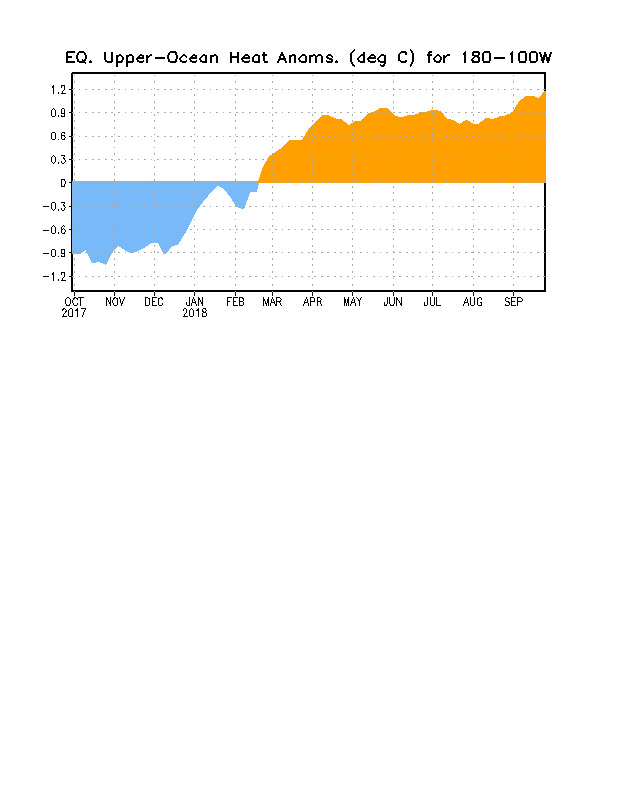 Nino 3.4 warmed from +0.3 to +0.6, which is the warmest week this year. Hello, El Niño, which is pretty much on schedule. Text of CPC weekly update of October 1 that has three of the areas at +0.6C and Niño 1+2 in the cold at -0.3C. About time! Do we have enough months for the event to count towards 2018? Hey Larry, it looks like EUROSIP is on the verge of nailing its late spring/early summer forecast. Yeah makes sense. Start monitoring the subsurface anomalies in January. 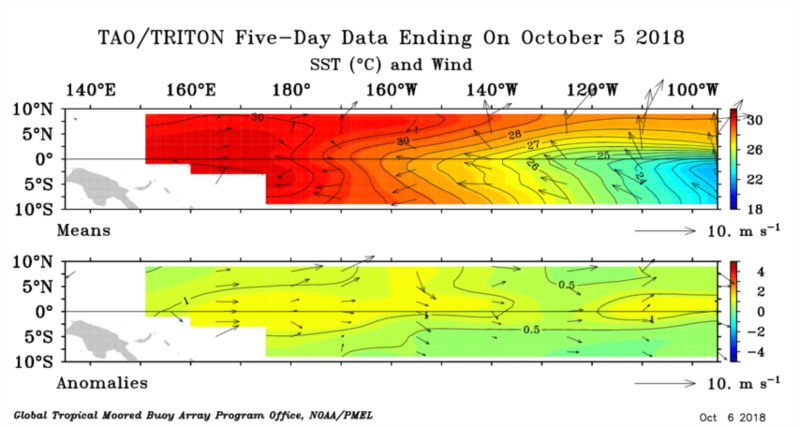 If we don't see a strong up welling Kelvin wave then we could be looking at back to back warm-neutral/El Nino events. Plenty, ASO probably won't make it but if it rises steadily the average for SON could especially if the two later months really goes to town. 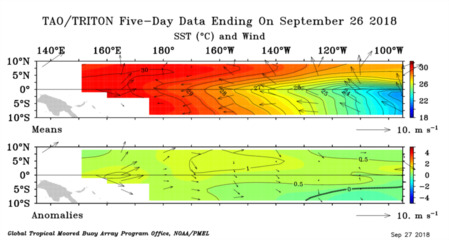 LarryWx wrote: Sep SOI comes in at El Niño favoring sub -8. I’m now giving 90% chance for ONI based El Niño. Tidbits 3.4 back down to near +0.43 after being near +0.67 just 2 days ago. However, the drop is no surprise after the rapid 0.7 rise the prior 7 days. It is heading down further but this drop is very likely just a temporary correction of sorts related to the day to day noise/volatility. I fully expect a resumption of warming later this week. Tidbits 3.4 had cooled back to +0.4 yesterday but it is now resuming warming. Little doubt now on the El Nino. The weak "modoki" look prior has shifted/overspread the rest of the basin. Warm waters have sloshed east with a flatter thermocline. 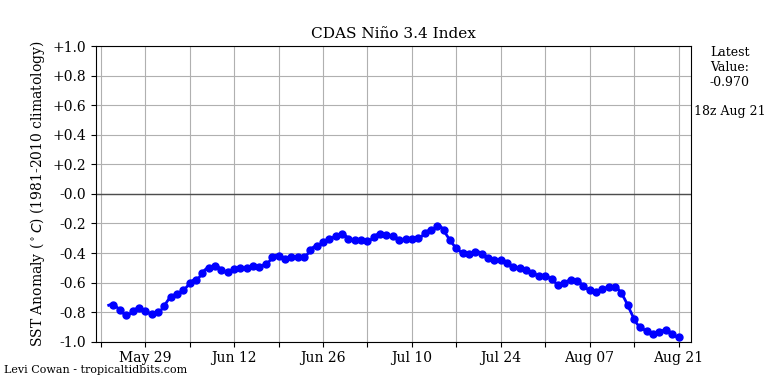 Ntxw wrote: Little doubt now on the El Nino. The weak "modoki" look prior has shifted/overspread the rest of the basin. Warm waters have sloshed east with a flatter thermocline. Doesn't look Modoki at all anymore. Another strong uptick coming on Monday. 1C+ can be seen throughout the basins. The coolest areas is limited to around 130W but even there it is above 0.5C. 180W is expansive with the areas of 1C+. If this trend continues we could be seeing 1C weekly readings by the end of the month. Ntxw wrote: Another strong uptick coming on Monday. 1C+ can be seen throughout the basins. The coolest areas is limited to around 130W but even there it is above 0.5C. 180W is expansive with the areas of 1C+. If this trend continues we could be seeing 1C weekly readings by the end of the month. Ntxw, I guess since it may be a basin elniño, is it winter cancel already? I've heard basinwide isn't good at all. Too much emphasis is put on what kind of El Nino. While there are different flavors and indeed some do behave differently, strength also matters. Not only that El Nino can shift from one region to the next and back again at varying times of their life cycles. If you are worried about winter, I would first look at the North Pacific pattern and see how it behaves along with the Arctic. Ntxw, do you or anyone else have the maps for all the regions besides 3.4 to find out what those are? Here is the text of the weekly update by CPC that has Niño 3.4 up to +0.7C.The other areas are also at +0.8C and +0.7C.